If you like cutting and gluing wing ribs, this scale control line model of the Curtiss P6-E Hawk is the job for you. Let me know after doing these 92 ribs for two wings if you still feel the same way. Designed for a .19 to .29 engine, this 31" wingspan model will certainly present a challenge even to the experienced modeler. Of course you need to be able to apply and finish the covering with a high level of perfection in order to fully appreciate the amount of work put into building it. Personally, I would hate to have to use opaque paint for a scale color scheme in order to not have to hide the framework. Then, I would be afraid to ever fly it! 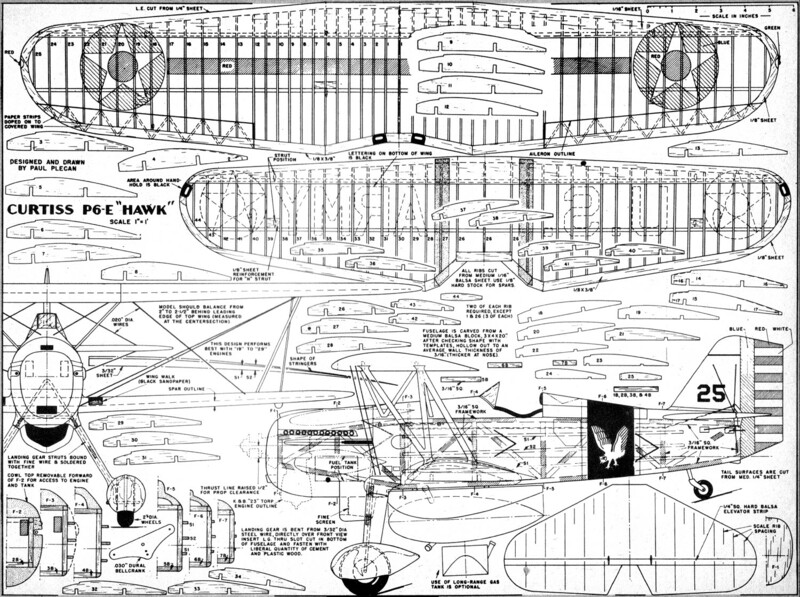 For the Flying Scale fan who has a weakness for biplanes, mention of any of the Curtiss "Hawks" brings instantaneous praise. Rugged, aesthetically pleasing in line and form, almost all "Hawk" models are generously endowed with the multiplicity of struts, wires, ribs and stringers that set the "detail hound" to drooling. If you are of this breed, pull up a chair, this is your meat. Our model, drawn to a scale of 1" to the foot, performs well with anything from .19 to .29 displacement, and has scale rib spacing. Construction is fairly straightforward, but the demands are high if a good-looking job is to result. After all, with 50 (yes, fifty!) ribs squeezed into 31" of span for that top wing, each one has to be "right on the button." The examination will be thorough when the gang spots this job at the local flying site! Built right, there's nothing like a "Hawk" to command attention, so let's clear the work bench. Basic framework is 3/16" sq. medium hard balsa as shown in profile view. Not all framework was shaded in on drawing; to do so would have obliterated other details. Top longeron is straight (just under stabilizer level); the bottom conforms with the bottom edge of the profile view. Forward of F-3 these longerons converge, ending at F-1. Diagonal bracing is a "must" as is ample drying time for the cement before removing from workbench for cross-brace installation. Cross-brace sizes are given above cockpit area. Note two each are required. Since 1B, 2B, 3B and 4B are similar, eight of this size will be needed. When installing cross-braces, note slight bevels needed at those ends where the longerons converge aft of cockpit. Those forward of F-4 do not get this treatment. Once basic framework is built, the balsa-block areas can be worked. Side blocks cement on first, followed by top and bottom. All cross-sections are on plan. A good bit of carving is required. Bending stringers to conform with side curves of fuselage suffice for some modelers, but we think it better to cut out shaped and tapered stringers as shown (S1 and S2). Then mere application is necessary, plus a bit of sanding to trim them exactly. It will be best to "fill-in" the area between stringer S2 and bottom longeron where lower wing passes through fuselage to obtain strength. Area below stabilizer is similarly "filled-in," scrap 3/32" or 1/8" balsa being just right. Due to the taper, the hole in fuselage for passage of wing will have to be large enough for rib #28 to pass through. After Wing is cemented in place, remaining space is filled in with Aero Gloss Plastic Balsa or similar compound to produce fillets at root of lower wing. 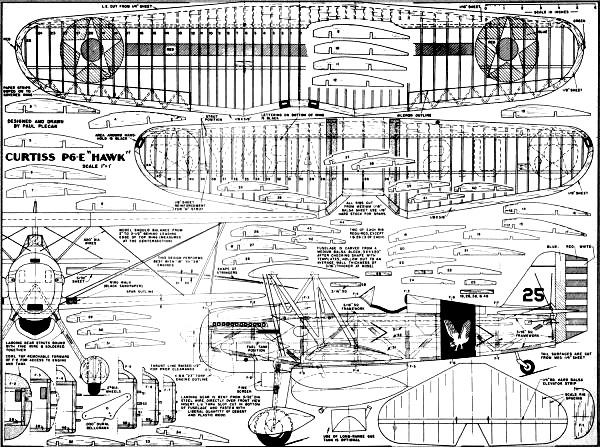 Wing construction is orthodox, but take care in cutting out ribs and spars - in this model, neatness counts. Firm, straight-grained wood is a "must" for entire wing. For the sake of simplicity, tail surfaces are 1/4 " sheet, sanded to airfoil (streamline) cross-section. For the rare individual who has all the info on proper scale rib spacing, etc., the tail can be built up, but it isn't necessary. Scale position of ribs can be simulated with strips of bond paper cemented to tail where desired. Individual ability will be governing factor in the completion of model, as will the amount of extra detail over and above that shown on plans. Correct information on coloring is a stumbling-block for many, so here is the data for your P6-E: fuselage was olive drab, although just prior to WW 2, some P6-Es had blue. Nose area, L.G. struts, hawk talons or claws on the wheel-pants, and band around rear of fuselage was black. White trim as shown. Hawk on each side of fuselage, white. 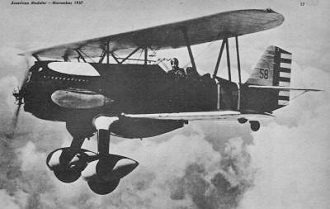 Wings entirely yellow, except for national insignia and red stripe on top wing; black lettering and national insignia on lower wing (bottom surface only). Hand-holds on lower wing tips and center section of upper wing are black. Horizontal tail surface entirely yellow, same for fin and that portion of rudder ahead of the hinge line. Red, white and blue striping on rudder as indicated on plans. White diamond trim on headrest. Black number on fin; same number in white on nose just above prop. These markings are those used by 17th Pursuit Squadron based at Selfridge Field, Michigan, in mid-thirties. Minor variations occurred in many P6-E Hawks. Wheel-pants that exposed the outboard face of wheel appeared on later versions in interest of faster wheel-changes or tire repairs. 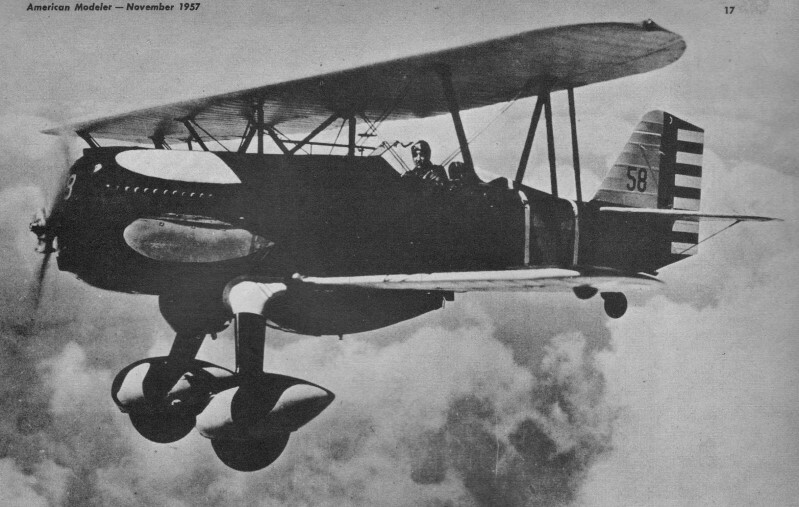 While enclosed cockpits and supercharged engines were also used, it is doubtful if these changes saw actual squadron service. Five pieces 1/16" x 2" x 36" for ribs, leading edge covering; (1) 1/8" x 2" x 36" for spars, wing tips, etc. ; (2) 1/8" x 3/8" x 36" trailing edge stock; (6) 3/16" x 3/16" 36" hard balsa for longerons, cross braces, etc. ; (1) 3/32 x 2" x 36" for stringers, fill-in material; (1) 1/2" x 1 1/4" x 3" nose block; (1) 1" x 2 3/4" x 14" turtledeck; (1) 7/8" x 2 3/4" x 5 3/8" top-front cowl; (1) 1" x 2 5/8" x 5" bottom cowl; (2) 3/8" x 3" x 5 1/4" side cowls; (1) 1/4" x 3" x 36" medium for tail surfaces (use leftovers for wheel-pants, etc. ); (1) 3/32" x 1/4" x 30" N-struts (pine or other hard wood); (1) 3/32" x 5/32" x 20" cabane struts (pine); (2) 5/16" 5/8" x 5" hard wood engine bearers; (1) 3/32" dia. x 36" steel wire for landing gears; (1) 2 1/2" bellcrank; (1) .045" or .049" dia. x 36" steel wire for pushrod; (1) 3/4" dia. tailwheel; (1) pair 2" dia. main wheels; (1) 3/16" dia. brass or aluminum tubing for scale exhaust stacks; (5) .020 dia. steel wire rigging; dope, cement, Aero Gloss Plastic Balsa as required; engine .23 cu. in. displacement (or close). tank, fuel line, props, related flying equipment as required. 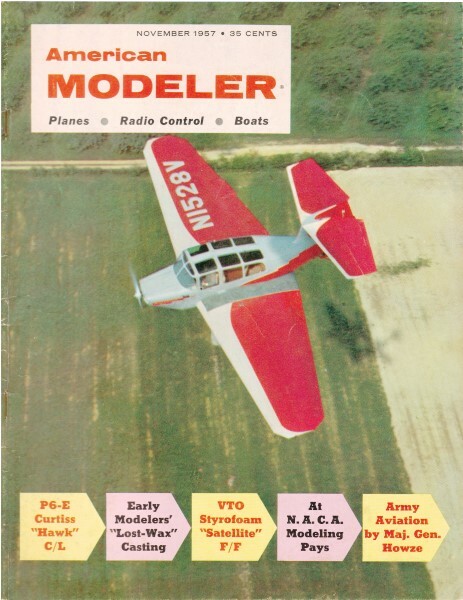 A few remarks concerning biplane U-control models will not be out of place here. Incidence of wings is of utmost importance - making a simple scrap "jig" to position upper wing is mandatory when struts are being cut to size and fitted. Strength of joints where struts join fuselage and where they meet wing surface is very. very important ... you don't want the upper wing to part company with its mate on a rough landing. A free-turning pair of wheels is necessary, since model sets higher off ground than a monoplane. Be ready to trot forward the moment the wheels touch down, so model rolls straight ahead with your control lines loose.